If you think your picture albums are a bit embarrassing, then you just have to check out Awkward Family Photos. I am in love with this website. It's absoluetly FAB-U-LOUS! Take for instance this "enchanting" couple. First of all the girl is wearing a... umm... fairy outfit? The boy, however, decided to go a bit casual with a white, semi-dressy shirt and jeans. 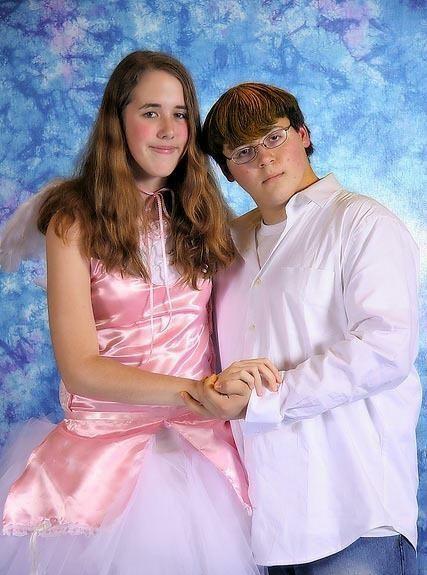 Isn't this supposed to be prom? And don't even get me started on that charming bowl-cut. Talk about swanky. These boys are simply adorkable. I must say, I absoluetly love, love, love the plaid suit. Very boss. Wearing sunglasses inside? That just screams cool. 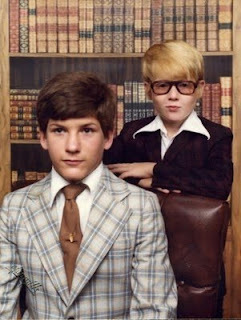 Taking family portraits in libraries is all the rage. 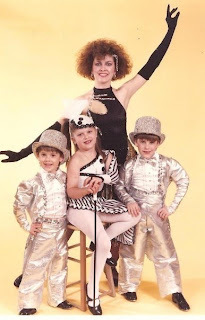 I just love corny dance photos, especially if you can tell the mom is the mastermind behind the picture. I have to say I am really taken by these outfits. I don't know if I've ever seen a silver suit look so bedazzled. Jazz Hands Everybody! Pose! Smile! JAZZ HANDS!! !